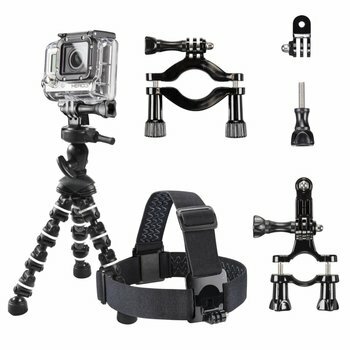 GoPro Familie Starers Set. Met de Family Set Pro van mantona en zijn verscheidenheid aan montagemogelijkheden kunt u elk moment op ieder tijdstip alles op beeld vastleggen. 1x Walimex tafelklem camera statief , 10cm, 1 x borstband "light"
You always wanted to film your family with your GoPro on holidays, in the garden or at the weekend? With the Family Set Starter from montana and its variety of mounting possibilities you can capture any moment in time. No matter whether by manual pod from a raised or flexible alignment, or with the help of the fixed table or camera tripod. With the tripod adapter you can conveniently mount your camera on tripods. The chest strap is perfectly suitable if you do not want to hold the camera in your hands all the time, but, for example, would like to film your playing children from the ego perspective. The strap offers freedom of movement with optimal stabilisation. No matter what type of sport the mantona hand tripod is the ideal solution to film oneself in such activities. Moreover, it offers higher stability and obviously also enables a further distance to the motif, if you are filming from the Ego-perspective. The convenient hand strap protects against loss during use. The Table and Camera Tripod by walimex with a height of 10cm is a particularly compact tripod which you can use with compact cameras in many situations. At a weight of only 100g, it can be transported in any bag without problems and without weighing you down. 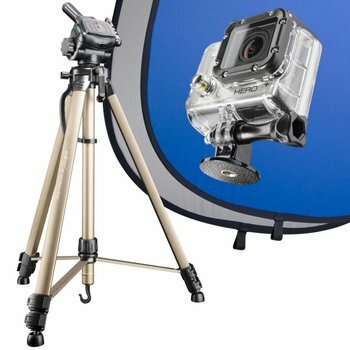 The tripod can be used as a table tripod on the one hand, but on the other hand the tripod head can also be tilted by 90 degrees and then be used as a pan handle in connection with a ball head Ã» ideal for video recording. For mounting on a ball head, it comes with a 1/4 inch thread on the bottom. The tripod is set up and folded within seconds. The tripod is made from sturdy plastic. The camera plate is rubberized in order to prevent the camera from slipping, and it comes with a 1/4 inch camera thread. The maximum load capacity of the tripod is approx. 0.5kg. The infinitely adjustable mantona chest belt "light"" adapts perfectly to your body and is particularly suitable for sports like mountaineering or e.g. paragliding or parachuting.